The T-shaped pillars discovered at Göbekli Tepe are big. The central pair of Enclosure D measure 5.5 m and weigh about 8 to 10 metric tons each. The surrounding pillars are smaller, but still reach around 4 m. How Stone Age people were able to make these pillars and to transport them seems a mystery to many of the site’s visitors. We can however offer some answers to both questions, as we are in the lucky situation to know where the pillars come from. Göbekli Tepe lies at the highest point of the Germuş mountain range, on an otherwise barren limestone plateau. 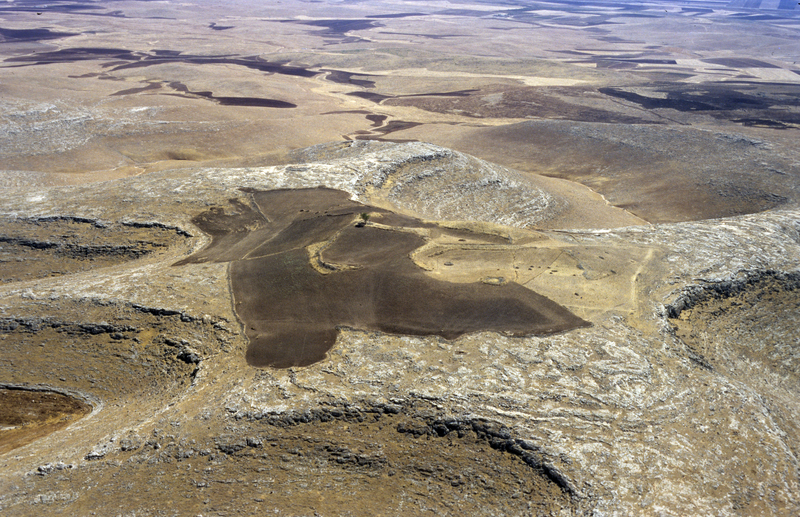 The plateau served as raw material source for Göbekli Tepe’s buildings (Photo: M. Morsch, ©DAI). Göbekli Tepe lies on an otherwise barren limestone plateau at the highest point of the Germuş mountain range. The quarry areas for the megalithic workpieces lie on exactly that plateau. As there are several loci with impressive traces of the Stone Age masons, the plateau forms part of the archaeological site and reservation. The location for the quarries was not chosen without reason. The limestone surrounding Göbekli Tepe is banked, strata of about 0.60 – 1.50 m thickness are divided by fault lines. This means that you just have to dig around a work piece, not also beneath it. As limestone goes, the material at Göbekli Tepe is pretty hard and cristalline, and there are no carstic phenomena. Which means that it is a first class raw material for sculpting and masonry. Even the hardest limestone is however so soft that it can easily be worked by flint tools. Flint picks, and possibly also wooden tools were used to dig channels in the form of the desired workpiece into the limestone. The Stone Age quarry workers would choose a location on the plateau where the banks had approximately the thickness of the final piece. When they reached the fault line, most probably wooden beams and wedges were used to lift the piece out. Although the limestone at Göbekli Tepe is of good quality, in several cases something went wrong and nearly finished pillars, stone blocks, rings and other pieces were left in the quarries. This is an especially lucky situation for the archaeologist, as we can observe the techniques employed first hand. 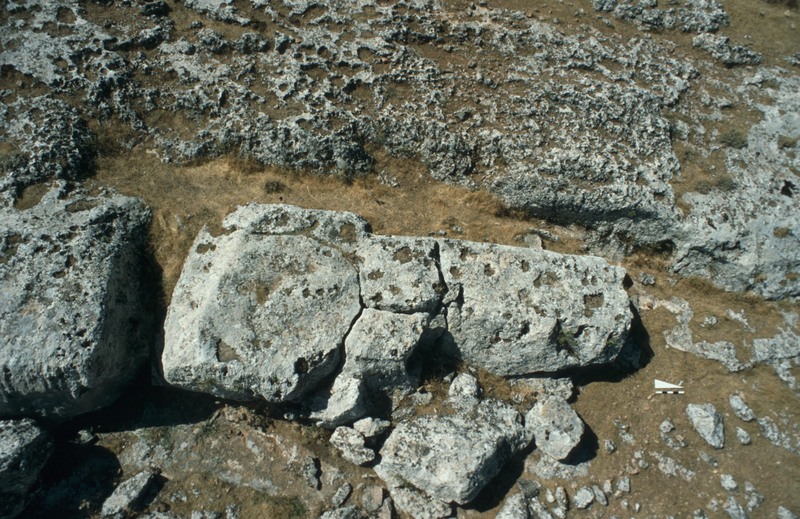 A T-shaped pillar of approximately 7 m length left in the quarries on the western plateau (Photo: © DAI). Most impressive is a T-shaped pillar far out on the edge of the western plateau. The location shows another work-reduction strategy: if you start at the edge of the plateau, you do not have very much material to remove on one side. And you know exactly how thick the limestone bank is before you start. The pillar still lying here is the largest discovered so far at Göbekli Tepe. It has 7 m and is 1.5 m thick. Why exactly it was left at the quarry site is not clear. A small crack may have formed in the stone during work, or some kind of natural flaw became visible. With workpieces that big, small flaws mean an instability that will most likely cause the pillar to break during transport or installation at its final location. In this case, the distance to the tell is several hundred meters. Another possibility is that the project turned out to be just a little too big in the end. For the second part of such a project, the transport, direct traces are absent from Göbekli Tepe. Ethnographic evidence from Indonesia, where megaliths are built still today at grave sites, hints at sledges and wooden planks as the tools of choice. The number of people involved is hard to guess. The distances the monoliths had to be hauled to the tell are comparatively small at Göbekli Tepe, in the worst case about 500m, in the best less than 100m. But the monoliths hewn from the bedrock are large and heavy, in case of the 7.0m pillar the weight would have been around 50 metric tons. Ethnographic records from the early 20th century report that on the Indonesian island of Nias 525 men were involved in hauling a megalith of 4 cubic meters (considerably smaller than at GT) over a distance of 3 km (considerably more than at GT) to its final location in 3 days using a wooden sledge (Schröder 1917). That such a large number of participants is not necessarily caused by the labour involved exclusively, shows another example from Indonesia. In Kodi, West Sumba, the transport of the stones themselves used for the construction of megalithic tombs is ritualised and asks for a large number of people involved as witnesses (Hoskins 1986). So, even if the making of the large pillars is not such a big mystery, and absolutely possible with Stone Age tools and detailed knowlegde of the raw materials (no need to involve aliens here! ), there are still some open questions to resolve. Hoskins, J. A. (1986) So My Name Shall Live: Stone-Dragging and Grave-Building in Kodi, West Sumba. Bijdragen tot de Taal-, Land- en Volkenkunde 142/1, 31–51. Schröder, E. E. W. (1917) Nias, ethnographische, geographische en historische aanteekeningen en studien. Leiden: Brill. Klaus Schmidt, Göbekli Tepe. Eine Beschreibung der wichtigsten Befunde erstellt nach den Arbeiten der Grabungsteams der Jahre 1995-2007, in: Erste Tempel – frühe Siedlungen. 12000 Jahre Kunst und Kultur. Ausgrabungen und Forschungen zwischen Donau und Euphrat. Herausgegeben für ArchaeNova e.V., Isensee, Oldenburg (2009) 187-223. Jens Notroff, Oliver Dietrich, Klaus Schmidt, Building Monuments – Creating Communities. Early monumental architecture at Pre-Pottery Neolithic Göbekli Tepe. In: James Osborne (Hrsg. ), Approaching Monumentality in the Archaeological Record. Albany: SUNY Press (2014), 83-105. Thanks for the info, particularly about evidence of use of flint/flint picks to cut pillars. Thank you for this superb post about Gobekli Tepe. This a wonderful archaeological site which I intend to visit.